It’s been ages. What on earth have I been doing? I’ve also been eating and cooking, but it’s just so hard to find time to write about it these days. It’s kind of sad. I think I lost a little bit of my blogging mojo. I’ve had blogging malaise. But here I am again, at the happy request of some of my favorite readers. Thanks so much for your comments and encouragement. It means the world to me. I think I need to play a little catch up. You definitely need to hear about Elvis’s pound cake. And then there’s the cupcakes. Oh so many cupcakes. Four trials down, one to go. Hopefully only one more, we shall see. But I’ll get to that later. Let us begin with Elvis. That grease loving monkey sure did grub with the best of them. A few months ago, in the September (gasp!) issue of Gourmet, they wrote about the intersection of music and food. As I flipped through the pages, looking for something delicious to make when I arrived on the East Coast to visit friends, I happened upon a recipe for Elvis Presley’s Favorite Pound Cake. Done. I love Elvis. I love pound cake. And I especially love recipes that begin: “This is the best pound cake we have ever tasted.” Could it live up to the hype? Upon arrival, my friends were just as interested in trying the recipe as I was. So we got to work. Six ingredients, simple instructions, just add a little extra beating time to the batter. In the oven it went. And the result? It was good. Certainly not the best pound cake ever. It was too eggy for that. But it was soft, and light, and still rich with a dense crumb. It kind of had a bouncy texture to it, like it would make a comfortable bed. But it aged well. Instead of getting dry, it got richer, and smoother, and better. That was its greatest asset. Don’t get me wrong, I enjoyed it. 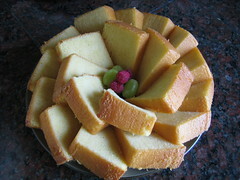 But I am still in search of the best pound cake ever. I leave my hat off to Elvis. The man was decisive in his tastes. He ate rich food like there was no tomorrow. And then one day there wasn’t. Put oven rack in the middle position, but do not preheat oven. Generously butter pan and dust with flour, knocking out excess flour. Sift together sifted flour and salt into a bowl. Repeat sifting into another bowl. The flour will have been sifted 3 times total. Beat together butter and sugar in the bowl of an electric mixer at medium-high speed until pale and fluffy, about 5 minutes in a stand mixer fitted with a paddle attachment, or 6 to 8 minutes with a handheld mixer. Add eggs 1 at a time, beating well after each addition. Then beat in vanilla. Reduce speed to low and add half the flour, then all of the cream, then remaining flour, mixing well after each addition. Scrape down the sides of the bowl, then beat at medium-high speed 5 minutes. Batter will become creamier and satiny. Spoon batter into pan and rap pan against work surface once or twice to eliminate air bubbles. Place pan in cold oven and turn oven temperature to 350 degrees Fahrenheit. Bake until golden and a wooden pick or skewer inserted in middle of cake comes out with a few crumbs adhering, 1 to 1 1/4 hours. 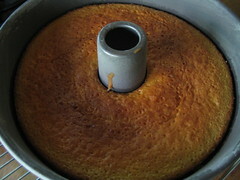 Cool cake in pan on a rack 30 minutes. Run a thin knife around inner and outer edges of cake, then invert rack over pan and invert cake onto rack to cool completely. Note: Cake keeps, covered well with plastic wrap or in an airtight container, at room temperature 5 days. Recipe courtesy of Gourmet magazine, September 2005.